Techno Scoop! Fine Fast Furious Funmobiles! This is one of those comparisons some of our staffers have always dreamed of. One of significance. One of excitement. One of anticipation. But mostly one of fun. We felt the time could not be more appropriate. With the Japanese and American automotive markets at the threshold of a new era, the American sport GT/luxury/sport-utility buyer has an incredible plethora of choices, all of which define new standards of automotive excellence. We gathered together, loaded the test equipment, located our vehicles and headed for LA. 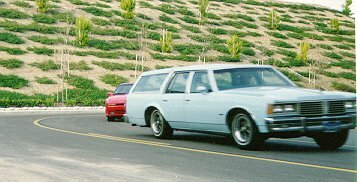 If you haven't guessed by now, the automobiles in question are the Toyota Supra Turbo and the Pontiac Catalina Safari Wagon. Two more worthy adversaries there are not. The Toyota, in its stunning Arrest-me-Red exterior, is borrowed from a Real Estate Accountant from Newport Beach. Judging from the loaner's demeanor, the Toyota's speedo has probably yet to see triple digits. 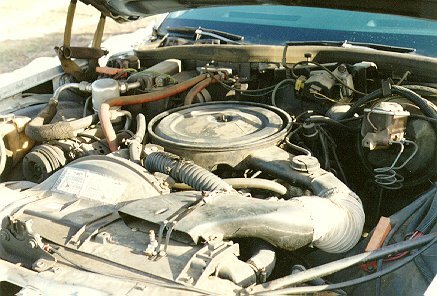 The Pontiac was located in South Orange County through an estate sale. With it's Crest toothpaste-blue exterior, matching interior, and National Rifle Association stickers proudly adorning the windows, it became all too clear which car was more prepared for the next few days. Almost 3500 miles were accumulated on the odometer of each vehicle over the course of their two day stay with us. Both cars were put through an extensive analysis of daily commuting, track test time and just general toodling around. Each car both shined and fizzled out as they were put through the paces. The test began at our Laguna Hills test facility in Orange County where we subjected them to our usual procedures; acceleration, braking, cornering, slalom, skidpad, etc. The Supra dominated in acceleration, braking, cornering, slalom, skidpad, etc. We noticed that the tail swung out almost at our will in the Supra, though it would occasionally get away from us, prompting observers to scream "He's out of control!" We never got the tail to swing out in the Catalina, as we weren't ready to invest in putting a full roll cage in the car. After accumulating 1000 miles on the odometer of each vehicle during our track test time, our mission of selecting the finest machanical gladiator of the roadways swayed somewhat toward the likes of the Toyota. But the real test of how a car will meld with the soul of some poor, unsuspecting customer is out on the road. Not just any road, but on the height of automotive worship that scars much of the land in this vast desert: the LA freeways. Our standard 2,500 mile trip started at 4 a.m. on a bright, clear Southern California day. The temperature was a perfect 72 degrees, winds were light out of the southwest, and visibility was 1.2 miles in haze and smog. Both cars started without a hitch, and we hit the road in search of some great food, fun, folks, and times. The twisties were invigorating at 4:20am. At "The 405/605" junction, we could feel both cars hitting the limits of adhesion, the Supra screaming in the carpool lane at 120 and the Catalina warping in the right lane at 58, just seven miles behind the Supra. We finally met up at 6am at the Santa Monica Omelette Parlor; the Catalina had the pleasure of getting bogged down behind a jackknifed tractor trailer on "The 405". Our growling stomachs told us it was omelette time. We walked up to the restaurant, salivating greatly at the thought of 4 eggs, ham, chili, and... the restaurant is closed Monday. It's Monday. The rest of the 2,500 mile trip was similar: we would drive through a traffic jam, arrive somewhere, find out that it had moved or just closed, drive somewhere else in a traffic jam, and hopefully accomplish just one goal set for the day. By the end of our journey we were weary, exhausted, and grimy, but we were also not exhiliarated, not happy, and generally just very cranky thanks to terrible traffic and our inability to plan well enough to actually get someplace meaningful. Perhaps the most memorable part of our trip was the 9 hour jaunt to Las Vegas. We were looking forward to a speedy, open road drive through the open desert. Alas, it was Sunday, so we spent most of our time following a pack of 79 cars, motorhomes, pickups, jet skis, and the like in the left lane at 80 mph. The Supra showed its prowess, though; at these higher speeds it could slice through the gaps like a hot knife through whipped margarine. The Catalina could only threaten, but we discovered that Las Vegas weekend drivers are a hardy bunch. We topped off our experience with dinner in Bob Stupak's Stratosphere Tower, the tallest building in North America, where we had a delicious spicy chicken and other mysterious fixin's for just $49.95. The Catalina was completely at home driving 15 mph, or even 45 mph, on "The 405". This silken, purring machine proved quite agile and effective at cutting people off. When those tough LA lawyers in their Mercedes saw the Catalina veering in front of them, they kept a wide, wide berth. The Catalina's lack of prowess at high speed actually made staffers more comfortable that traffic was moving sluggishly. Only one small nitpick: one staffer complained incessantly about "smog headaches", apparently related to the lack of a recirculation button on the climate control. We were able to dump this cranky staffer off just east of downtown LA, and we're happy to report we haven't heard anything from him since. The Supra's speed, agility, high performance, and it's superb high speed feel proved to be its biggest downfall. 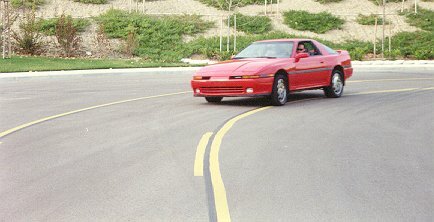 Upon the open freeway, staffers would find themselves screaming at the traffic, since it prevented them from using the Supra's great capabilities. One staffer actually gouged one of his own eyes out while driving on "The 405" at 5pm. Nobody can tell the difference now, thanks to a glass eye. All staffers felt frustrated, angry, frazzled, saddened, and cranky when behind the wheel of this car in any amount of traffic. We found the cure for the Supra's problem: take a different road. By driving from Santa Ana to Los Angeles via Palm Springs and Victorville, we found we were at peace with the open road, even though it took at least 4 hours to get anywhere. Our staffer is happy to report that the Catalina fits well on a flat bed tow truck, and even better behind a regular chain tow truck. We found the Supra did an excellent job of transporting the Catalina's driver behind the tow truck to the repair shop. AAA could not have been more helpful, though we scorn their policy of only permitting three free tows per year. So after a long test of these cars, both on the track and on the road, we were suitably impressed with both cars, though for greatly divergent reasons. 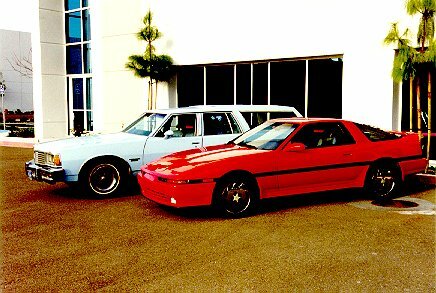 The Supra was the hormone streaked adolescent, the wild stallion, the F1 racer (with no earplugs required), the great and glorious red beast which begged to be flogged. But what machine would we choose for our ultimate experience of automobile ownership? Which machine would we revel in driving through tight mountain passes, yet be able to pick up the kids at Little League later that day? Which beast could satiate our every mobile desire, to live life to the fullest? The Supra has its advantages, to be sure. It is a joy to drive on the open road, at speeds so far over the legal limit that we can't imagine the cost of being caught doing so. It has an ergonomically perfect interior: everything is exactly where it should be; perhaps our only slight nitpick, to make this the ultimate, benchmark, supreme, God-like interior would be to have more directional map lights. It has a racy engine, which pelts you to the seat when engaging the turbo, and it has the looks to match. And yet our object of passion still had its glaring dark side: in the real world, where every other car in the universe is strategically poised to make its way in front of you wherever you might be trying to go, the Supra became the iron maiden of the highway. There's not enough space to take people; there's not a supreme panarama out many glass windows to see every turn of events around you; and most importantly, real world driving conditions make it a frustrating heartache to be driving this machine at a tiny fraction of its capabilities. While the Catalina could not match the Supra in pure, unbridled, brutal driving force and speed, it had so many shining bright spots that we came away truly dazzled and impressed. Ask the staffer who moved his belongings in just one trip across the California landscape. Ask the staffers who turned the Catalina into the rolling fun wagon, full of happy people comfortably cruising to their destination. The smooth drivetrain, the snappy, thrusting pickup, and the cloud-like ride could not be touched by any other vehicle. 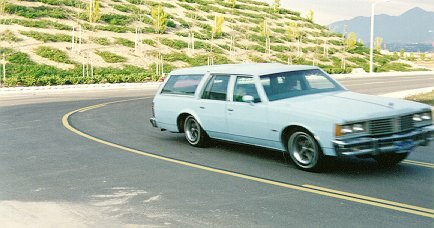 It was a comforting vehicle to drive in the real- world vagaries of freeway traffic and lines of stoplights. 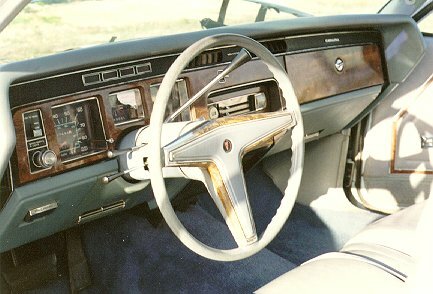 While the ergonomics were not quite perfect, the center armrest made the driving position complete and comforting for the long haul. The open, airy interior reminded many of the better days of Hondas, as you can see nature in its great splendor from every angle in this car. This was the most balanced of the two machines, the one that might not be the first choice to flog on the cliffside road thousands of feet above the ocean, but the one that would be the car for everything for everyone. We could not be more impressed with this fine piece of automotive art. Which automobile is the best here? It was truly a close contest, but we can say there is a definite automotive world benchmark, the true victor, the one and only choice that could be made. It is the big blue wonder that will take us into the 21st century and beyond. After a cunning high speed takeover, the Catalina bows gracefully into turn 8 at the Laguna Hills test facility. 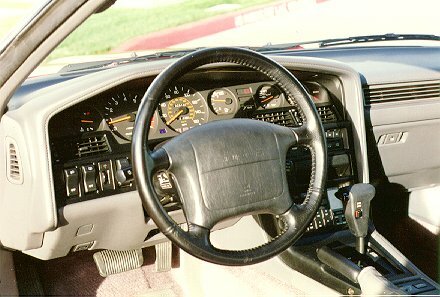 The Catalina dash, with its black on white square analog gauges, shows a deviation from the norm that we don't often see. We like the dead-center horn and the confidence inspiring "Radial Tuned Suspsension" decal. The Supra dash, with its perfectly placed black on white circular analog gauges, is completely functional, yet not so overly high-tech that you feel like you're landing a 747. Both cars show considerable body roll in tight corners, though here at turn 4 at the Laguna Hills test facility the Supra is going three times as fast as the Catalina. 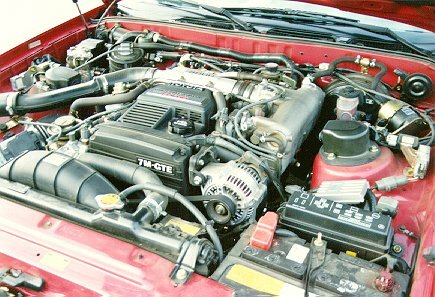 Both cars have very large, impressive engines. We have no idea how they work. Email the AutoXS Editors at autoxs ~at~ rstack ~dot~ com .